Honey bees, which enhance agricultural productivity and help maintain biodiversity by their pollination activity, have declined worldwide in last years. Potential stressors causing colony collapse disorders include agricultural insecticides, which target principally ion channels of insect nervous system. Among them, voltage-gated calcium channels underlie a multitude of intracellular processes, such as gene regulation, neurotransmission and muscle contraction. However, in honey bees, little is known about their biophysical properties and pharmacology. 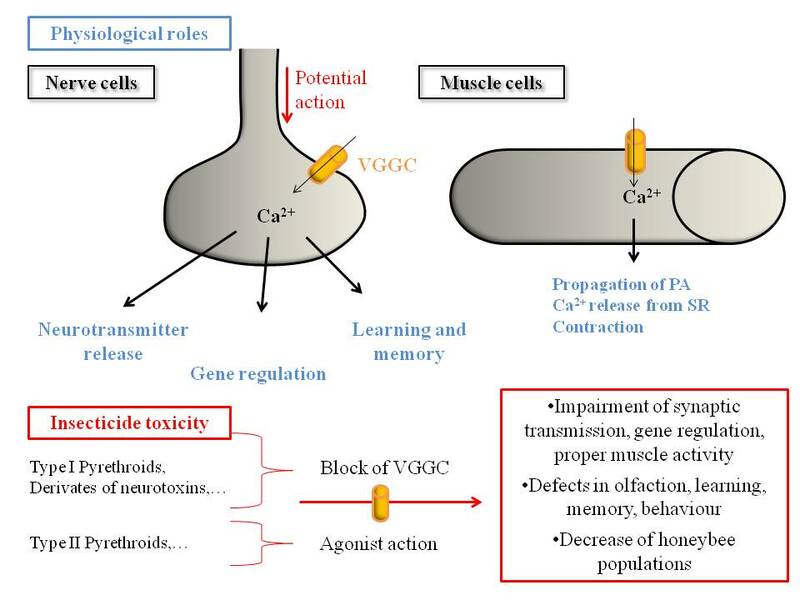 In this review, we discuss their physiological roles in honey bees, notably in the olfactory system and muscle activity, and analyze their potential involvement in insecticide toxicity in light of studies on their modulation by neurotoxins and pyrethroids. Honey bees, by their pollination activity, contribute to vegetal biodiversity stability and sustainable agriculture . But their populations have declined worldwide in recent years. A variety of stressors have been implicated, including climate changes, agricultural practice and pesticides. In addition to the loss of hives ascribed to acute exposition to pesticide overdoses, chronic exposition to sub-lethal doses of pesticides or metabolites present on bee, in hives or even into royal jelly has been suspected to be involved in this phenomenon. Nevertheless, little is known concerning the mechanisms of insecticide sub-lethal toxicity. Many of worldwide used insecticides act on specific insect neuronal receptors and ion channels, including nicotinic receptors and voltage-gated sodium channels (VGSCs) . These compounds also act at low doses on vertebrate and invertebrate voltage-gated calcium channels (VGCCs) [3‑6], but the impact on bee physiology is still unknown. VGCCs are macromolecular complexes which localize in the plasma membrane, open in response to membrane depolarization and mediate a subsequent influx of extracellular calcium ions (Ca2+). Ca2+ entry in cell generates both a depolarizing electrical signal and a chemical signal. Indeed, Ca2+ regulates many crucial processes including hormone and neurotransmitter release, muscle contraction and gene expression . As found for other insects, the sequencing of the Apis mellifera genome  reveals that it encodes different VGCC subunits. This review is focused on the role of VGCCs in insecticide toxicity. After a presentation of the VGCC structure and their putative sequences in Apis mellifera genome, we summarize the current knowledge on Ca2+ currents recorded in different honeybee cells and their identified physiological roles. Finally, we review the last studies concerning the toxicity of neuropeptides and insecticides on VGCCs. These considerations demonstrate that molecular tools are necessary to assess the roles of VGCCs in honeybee physiology and toxicity and also suggest that insect VGCCs could be a more specific target for future insecticides. VGCCs are transmembrane proteins which belong with VGSCs to a superfamily of structurally related voltage-gated ion channels. The voltage-gated calcium selective pore is formed by the α1 subunit, a 170–250 kDa protein, which comprises four homologous domains constituted by six putative transmembrane segments (S1-S6) (Figure 1a). The four domains, connected by intracellular linkers, fold circularly together to form a pore. The S5 and S6 segments define the wall of the pore whereas the membrane re-entrant loops constitute the ion-selectivity filter. The S4 segments carry multiple positive charges and by their ability to move through the membrane under the influence of changes in the electric field act as voltage sensors and open the channel pore . Electrophysiological studies performed with vertebrates VGCC subunits have demonstrated that the α1 subunit largely determines both the pharmacological and biophysical properties of Ca2+ currents. These properties have defined different current subtypes, according to their L ow or H igh V oltage for A ctivation ( LVA or HVA ), their L ong-lasting or T ransient kinetics of inactivation ( L or T -type), and their sensitivity or not to Dihydropyridines (DHP) and different toxins (Figure 1b). In vertebrates, ten genes coding for different α1 subunits underlie this diversity and can be grouped in three major families on the basis of their amino acid sequence similarity: CaV1, CaV2 and CaV3 . Figure 1. Presentation of VGCCs. a. Schematic representation of the VGCC molecular structure and membrane topology. VGCC pore is formed by the α1 subunit, which comprises four homologous domains (I-IV) constituted by six transmembrane segments (S1-6). The S4 segments contain positive charges and act as voltage sensors. S5, S6, and the re-entrant loops form the walls of the pore. HVA VGCC comprises in addition one of each α2-δ, γ and β subunits. (Adapted from King, 2007 ) . b. 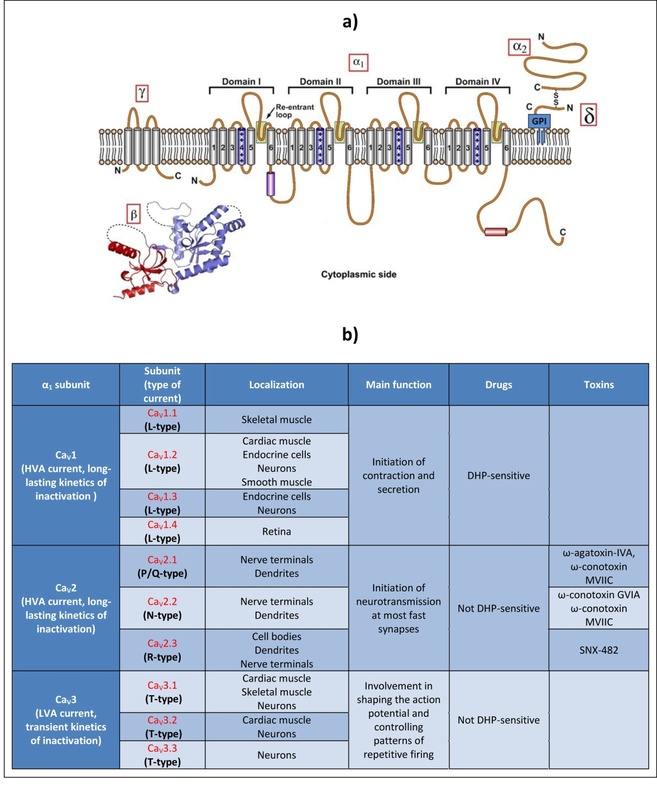 Correspondence between vertebrate α1 subunits and the identified calcium currents, their main localization, function and defining pharmacology. CaV1 and CaV2 α1 subunits are associated with auxiliary subunits: the extracellular α2 subunit, the δ subunit linked to the α2 subunit via a disulfide bond and to the plasma membrane through a glycosylphosphatidylinositol (GPI) anchor , the cytosolic β subunit, and in some cases, a transmembrane γ subunit. α2-δ, β and γ subunits finely modulate the properties of the α1 subunit, such as the kinetics and the voltage dependence of activation and inactivation . In addition, the β and α2-δ subunits are reported to facilitate membrane trafficking and membrane insertion of the channels . Auxiliary subunits can also modify the α1 subunit sensitivity to certain molecules. For example, a variant β subunit confers praziquantel-sensitivity in platyhelminths . The analysis of the Drosophila melanogaster genome revealed that it encodes three α1 subunits, a single β subunit, three α2-δ subunits and a single putative γ subunit . The amino acid sequence comparison of the three α1 subunits, designated Dmca1D, Dmca1A and Ca-α1T, shows that they can be classified respectively as CaV1, CaV2 and CaV3-type channels, corresponding to the three families identified in vertebrates . The analysis of other invertebrate genomes reveals a single ortholog for the CaV1-, CaV2-, CaV3-type α1 subunits encoded in the Drosophila genome . Similarly, the Apis mellifera genome  contains three genes encoding α1-subunit types, three genes encoding α2-δ subunits and a single gene encoding a β subunit. The alignment of α1 subunit sequences from Drosophila melanogaster and Apis mellifera genomes indicates that VGCCs have been less conserved throughout the course of insect evolution than the VGSCs . The percent identity between the CaV1 of the two insects is 75 %, between the CaV2, 85 %, and between the CaV3, 89 %. This suggests specificities between insects VGCCs, potentially underlying differences of pharmacological sensitivities. Therefore, it could easier to develop insecticides targeting VGCCs which kill pests and keep honeybees alive. Invertebrate Ca2+ channels possess electrophysiological properties and pharmacological sensitivities which are distinct from their vertebrate counterpart, thus disrupting the classic classification of currents in L-type, N-type, P/Q-type, R-type and T-type . So a molecular classification in CaV1, CaV2, and CaV3 types based on the sequence homology between α1 subunits appears more relevant for invertebrate VGCC . Ca2+ current diversity in invertebrates is further explained by different mechanisms, including RNA editing, the alternative splicing of subunit transcripts, post-translational modifications and the presence of auxiliary subunits . To date, no successful heterologous expression of a functional recombinant honeybee VGCC has been reported in the literature and none sequence has been cloned. The biophysical and pharmacological characterization of these channels is then quite poor. Nevertheless, honeybee nervous and muscular systems have been studied at the cellular and molecular level with electrophysiological techniques. Hence, several ionic currents, including potassium, sodium and calcium currents, have been characterized in isolated, cultured neurons or muscular fibres. In honeybees, smells are sensed by olfactory receptor neurons (ORNs) whose dendrites are located inside structures, the sensilla, present on antenna . The ORNs express each a single functional receptor gene and send their axon to the antennal lobes, the centres for primary processing of olfactory information in the insect brain (Figure 2a). In the antennal lobes, ORN axons converge according to their receptor type into specific spheroidal areas, called glomeruli, and form synapse with projection neurons (PNs) and local interneurons (LNs). PNs relay olfactory information to the lateral protocerebral lobes and the mushroom bodies, both located in the protocerebrum. In the mushroom body calyces, the PNs synapse onto the Kenyon cells, the intrinsic elements of the mushroom bodies. Both the antennal lobes and the mushroom bodies are involved in memory formation . Studying ionic currents in the isolated Kenyon cells somata by tight-seal whole-cell recording, Schäfer et al. identified a Ca2+ current that is completely blocked at 50 μM of cadmium (Cd) and is affected by verapamil and nifedipine, two blockers of L-type currents, only at high concentrations (100 μM) . The substitution of Ca2+ with barium (Ba2+) increased the Ca2+ current and slows the run-down of the current, indicating that VGCC are more permeable to Ba2+ than to Ca2+ and suggesting that the current is inactivated or regulated in a Ca2+-dependent manner, two properties reported for vertebrate L-type Ca2+ current. Whole-cell recording from honeybee ORNs led to the detection in some ORNs of a similar Cd-sensitive Ca2+ current . Another study analysed the voltage-sensitive ionic currents of cultured antennal lobe PNs and Kenyon cells in the honeybee brain . In the two neuron classes, the densities of currents through VGCC and the voltage-dependency of current activation were similar: Ca2+ currents activated rapidly and inactivated slowly. Moreover, the involvement of Ca2+ in synaptic plasticity and in the regulation of gene expression underlying the long-term memory has been tested by Perisse et al. by using the Pavlovian appetitive conditioning of the proboscis extension reflex, in which honeybees learn to associate an odour with a sucrose reward. The modulation of the intracellular Ca2+ concentration in the brain showed that a Ca2+ influx is both a necessary and a sufficient signal for the formation of olfactory protein-dependent long-term memory. These observations suggest that the VGCC expressed in neurons could play an important role in the olfactory long-term memory. The complex and rich behaviour of honey bees require the gathering of sensory information by the antenna. These sense organs contain mechanoreceptor, chemoreceptor, temperature-, humidity-, and CO2-sensitive receptor neurons, which send projections into the antennal lobes or dorsal lobes (Figure 2b) . Six muscles control antennal movements in the honey bee: four of them are responsible for moving the basal segment of the antenna (the scape), and the two others the distal segment (the flagellum). These muscles are controlled respectively by nine and six motor neurons, whose cell bodies are located in the soma layer lateral of the dorsal lobes in the deutocerebrum . Whole-cell patch-clamp recordings in cultured antennal motor neurons, in intact brains, in semi-intact brains and also in brain slices revealed a Cd-sensitive Ca2+ current which activated above -45 to -40 mV, with a maximum around – 15 mV, similarly to those found in Kenyon cells . Figure 2. Anatomic elements of the honeybee head. Anatomic elements of the honeybee head. a. Overview of the olfactory system in a schematic front view of the honeybee head. Olfactory information is gathered by olfactory receptor neurons located in antenna (blue), which send projections into glomeruli (G) located in antennal lobes (purple and green) and connect the projection neurons (PN) and local interneurons (LN). PN relay olfactory information to Mushroom bodies (red), involved notably in olfactory memory. 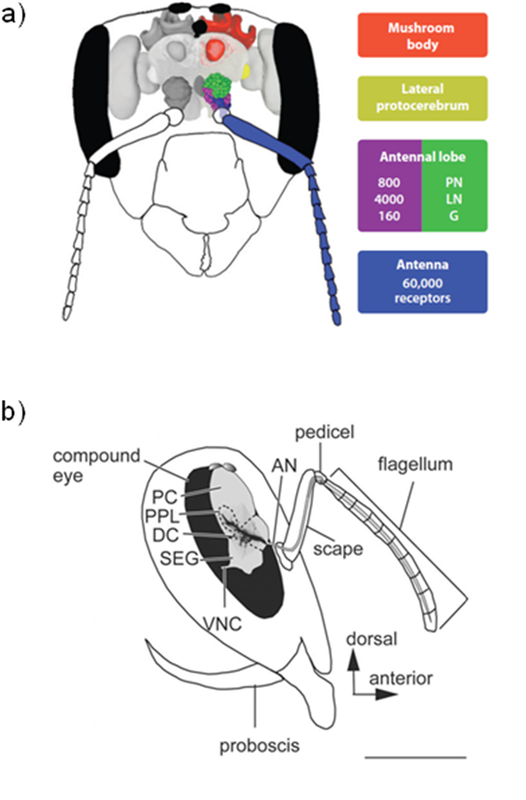 From Galizia and Rossler, 2010 . b. Schematic lateral view of the head capsule and the antenna. The antenna comprises three parts, the scape, the pedicel and the flagellum. Antennal muscles are controlled by motor neurons, whose the cell bodies are located in the soma layer lateral of the dorsal lobes in the deutocerebrum. AN, antennal nerve; DC, deutocerebrum; OL, optic lobe; PC, protocerebrum; PPL, posterior protocerebral lobe; SEG, subesophageal ganglion; VNC, ventral nerve cord. Scale bar: 1mm. (Reproduced from Ai et al., 2007 ). Proper muscle activities underlie many honeybee tasks, including honeycomb cleaning, nursing, thermogenesis, flight foraging, and inter-individual communication. The electrical properties of the honeybee skeletal muscle fibre were examined by using the whole-cell patch clamp technique on enzymatically isolated skeletal muscle fibres from honeybee leg . Both Ca2+ and K+ currents appeared to be involved in shaping actions potentials in single muscle fibre, and the inward current responsible for the rising phase of the action potential seems to be carried by VGCCs. Indeed, action potentials were blocked by Cd2+ and La3+, two VGCC blockers, but not by tetrodotoxin (TTX), a VGSC inhibitor, suggesting, as opposed to vertebrate muscles, a lack of sodium current in honeybee muscles  (Figure 3). In addition, it was observed that action potentials lead to a brief elevation of the intracellular Ca2+ concentration which is called Ca2+ transient. The Ca2+ influx through VGCC could trigger the Ca2+-dependent release of Ca2+ from sarcoplasmic reticulum, leading to the Ca2+ transients in response to action potentials, and finally to proper muscle contraction . These studies provide evidence that Ca2+ currents could contribute to neuromodulation, synaptic transmission, action potential generation, and muscle contraction. So, VGCCs appear to be involved in crucial physiological roles, including the detection, processing and memory of complex odours, the control of antennal movement and the proper activity of muscles. Figure 3. The inward current responsible for the rising phase of the action potential is carried by VGCC in honeybee muscle fibres. The inward current responsible for the rising phase of the action potential is carried by VGCC in honeybee muscle fibres. a,b. Current-clamp experiments in muscle fibres from honeybee. 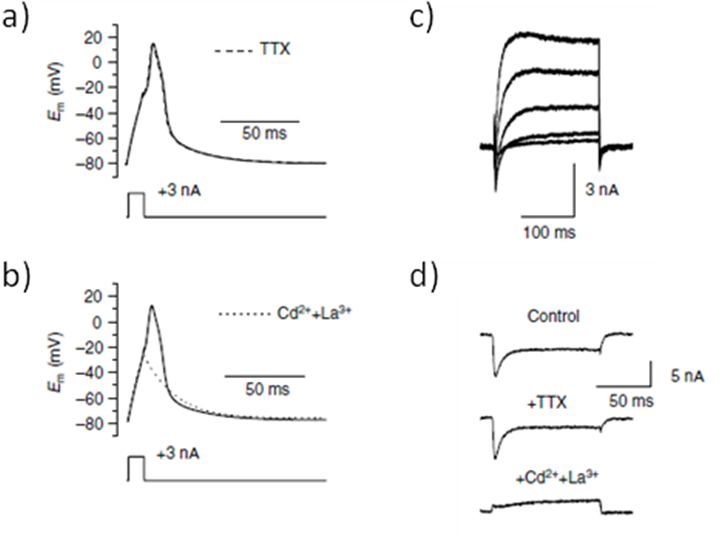 Tetrodotoxin (TTX), a voltage-gated sodium channel inhibitor, had no effect on the action potential (a) , whereas the VGCC blockers Cd2+ and La3+ (b) converted the regenerative action potential response (black line) into an electrotonic response (broken line). Em, voltage command. c,d. Whole cell voltage-clamp currents in muscle fibres from honeybees. A series of depolarizations bringing the membrane potential from -80 mV to -30 mV, -10, +10, and +30 mV over a period of 200 ms activated both inward and outward currents (bi). In a depolarized muscle fibre from -80 mV to +10 mV for 100 ms, Cd2+ and La3+ (lower trace), contrary to TTX (middle trace), block the inward component of the voltage activated currents. Cd2+, cadmium; La3+, lanthanum. (Reproduced from Collet and Belzunces, 2006 ). The venoms of numerous arthropods, cnidarians, molluscs, and vertebrates contain a huge diversity of peptidic neurotoxins that target ion channels, including VGSCs and VGCCs . Some of these toxins have been used to define vertebrate Ca2+ current subtypes, but the differences of structure between insect VGCCs and their vertebrate counterparts are sufficient to disrupt this pharmacological characterization. In the past decade, the repertoire of peptidic toxins that specifically modulate the activity of insect VGCCs has grown, offering the basis for a potential development of novel insecticides . Examples of toxins blocking insect VGCC are reported in the Figure 4a. Regarding honeybee, it appears crucial to determine precisely the effects of these toxins on molecularly-identified VGCCs to develop molecular screens testing pesticide toxicity toward honey bees. Among synthetic insecticides, pyrethroids are widely used for forty years in agriculture and in public health to control insect pests and disease vectors, respectively . Due to the risk of exposure and adverse effects in the population, studies have been performed to discern their mechanisms of toxicity and neurotoxic actions. Their insecticidal actions are known to depend on their ability to bind to and alter insect VGSCs . However, studies on mammalian channels have suggested that other target sites could be involved in the acute and chronic neurotoxic effects of pyrethroids, including particularly VGCC . Pyrethroids were initially divided into two subgroups according to the distinct intoxication syndromes that they produce in mammals: the T-syndrome pyrethroids induce a tremor response whereas the CS-pyrethroids induce a choreoathetosis with salivation response . Another refers to their chemical structure: the Type II pyrethroids, but not the Type I, contain an α-cyano-3-phenoxybenzyl moiety. Type I compounds are usually considered to produce the T-syndrome of intoxication and Type II the CS-syndrome, but this correspondence is not perfect. The different syndromes produced by these structurally-distinct pyrethroids may be explained partially by their different effects on VGCCs . Patch-clamp recordings were used to examine the alterations of VGCCs by pyrethroids, and representative results are reported in the Figure 4b. L- and T-type currents were described to be inhibited by tetramethrin (Type I) in neuroblastoma cells, in cardiac sino-atrial node cells, and in intestinal smooth muscles cells . Hildebrand et al. also reported that all classes of mammalian VGCCs are targeted by allethrin, a Type I pyrethroid . For each subunit tested, allethrin produced a significant acceleration of the inactivation kinetics and a hyperpolarizing shift in the voltage dependence of inactivation. Figure 4. Compounds modulating voltage-gated calcium channels. Compounds modulating voltage-gated calcium channels. a. Examples of toxins targeting insect VGCC. DUM neurons: dorsal unpaired median neurons. b. Effects of pyrethroids on electrophysiological measures of VGCC function. Block and Increase refer to effects on peak current amplitude. T422E is the mutation of the threonine 422 into glutamic acid, mimicking complete phosphorylation of the CaV2.2 channel. Question marks mean that the type of channel or current is only a hypothesis. HVA, MVA, LVA: High-, Mid-, Low- Voltage for Activation. The review of Shafer and Meyer presents studies which examine the effects of pyrethroids on neurotransmitter release by using mammalian brain presynaptic terminals (synaptosomes) or brain slice preparations . But, at that time, studies were not providing a comprehensive and clear mechanism for the pyrethroid-induced neurotransmitter release. Indeed, in some cases, the release was completely inhibited by TTX, suggesting an effect via the VGSCs. But in other cases, pyrethroid-dependent release was only partially sensitive to TTX, correlated with Ca2+ uptake and therefore, was ascribed to a direct effect of pyrethroids on VGCCs. In a similar study, Symington et al. tested the effect of eleven commercially available pyrethroids on both the Ca2+ uptake and the depolarization-evoked neurotransmitter release in rat brain synaptosomes . Five out of the six Type II pyrethroids and one of the five Type I pyrethroids were potent enhancers of both Ca2+ and neurotransmitter release in presence of TTX. These results suggested therefore that some pyrethroids, and especially those of Type II, directly enhance neurotransmitter release through an increase of voltage-dependent Ca2+ currents. However, the analysis of the action of eleven pyrethroids into cultured mouse brain neocortical neurons failed to confirm a direct action on VGCCs . Indeed, nine out of eleven pyrethroids triggered a concentration-dependant increase in intracellular Ca2+ which was completely inhibited by TTX, suggesting that the Ca2+ influx was a secondary result of pyrethroid-dependent activation of VGSCs. Interestingly, a recent study using specific VGCC antagonists in order to identify the VGCC subtypes affected by allethrin indicated that allethrin stimulates the ω-conotoxin GVIA-insensitive current and inhibits the nimodipine-insensitive current . This differentiated modulation of various VGCC subtypes by allethrin, and possibly by other pyrethroids, may explain the observation of conflicting results between studies. Studies in synaptosomes  showed that deltamethrin acts as a VGCC agonist, opening the CaV2.2 channels, and thus increasing the Ca2+-dependent release of neurotransmitters, which may undergo neuroexcitatory effects. Inversely, deltamethrin causes a partial block of CaV2.2 channels expressed in Xenopus oocytes. But when this channel is mutated on a critical amino acid, mimicking a permanent phosphorylation, then deltamethrin increases peak current amplitude of CaV2.2 channels . These observations suggest that post-translational modifications of VGCC subunits, and so regulatory proteins, could modify the effects produced by deltametrin, and possibly by other pyrethroids, contributing to obtain different results between models. In adult honeybee skeletal muscle fibres, allethrin blocks the nifedipine-sensitive voltage-dependent Ca2+ current, which underlies the action potential depolarizing phase and the Ca2+ release from sarcoplasmic reticulum very tightly . This block of muscle VGCCs reveals myotoxic effects of pesticides in honey bees. From these different studies, we can conclude that pyrethroids either block or facilitate Ca2+ entry into neurons or muscle cells. These effects appear to be dependent on species, tissues, VGCC subtypes, their post-translational modifications and the pyrethroids employed. The specificity of the insect VGCCs and the poor foreseeability of the studies don't allow us a direct extrapolation to honey bee, but suggest that VGCCs have to be considered as potential targets for pesticides. The identification of voltage-dependent Ca2+ currents in neurons and muscle cells reveals the importance of VGCC in the physiology of honey bees (Figure 5). In muscle fibres, VGCC underlie the rising phase action potentials and proper contraction. Moreover, Ca2+ currents were recorded in all studied neurons, and are particularly involved in long-term memory. Recently, studies have demonstrated that some neurotoxins from venoms target specifically VGCCs and are considered as potential prospective insecticides. Certain pyrethroids, widespread insecticides known to target VGSCs, modulate VGCCs by blocking or enhancing their activity. Recent interesting studies demonstrate that post-translational modifications can modify the pyrethroid effects on VGCCs. Together, these observations suggest that VGCCs could be involved in the chronic toxicity in honey bees induced by sub-lethal expositions of insecticides (Figure 5). Therefore, it appears necessary to understand thoroughly the physiological roles, the biophysical properties and pharmacology of VGCCs in honey bees. The two ongoing challenges are the development of molecular tests assessing the toxicity of agricultural insecticides and the production of specific insecticides safer for honey bees. In this way, the cloning and expression of the identified VGCC subunits in the genome of Apis mellifera as well as the development of molecular tools, including antibodies and siRNA, could lead to a better understanding of both the physiological functions of VGCCs in insects and the molecular effects of insecticides. Figure 5. Honeybee VGCCs underlie many physiological roles and could be targeted by insecticides, leading to toxicity and impairment of the honeybee behaviour. Honeybee VGCCs underlie many physiological roles and could be targeted by insecticides, leading to toxicity and impairment of the honeybee behaviour. VGCCs, underlying many intracellular processes, play crucial physiological roles in honeybee nervous system and muscles (indicated in blue). Studies with neurotoxins and insecticides, including notably pyrethroids, show that they target insect or mammalian VGCC, blocking or increasing their current. We can therefore hypothesize that insecticides lead to deleterious effects by targeting honeybee VGCCs, as described in the red box. 1.Krupke CH, Hunt GJ, Eitzer BD, Andino G, Given K: Multiple Routes of Pesticide Exposure for Honey Bees Living Near Agricultural Fields . PLoS ONE 2012, 7 :e29268. 2.Raymond-Delpech V, Matsuda K, Sattelle BM, Rauh JJ, Sattelle DB: Ion channels: molecular targets of neuroactive insecticides . Invertebrate Neuroscience: IN 2005, 5 :119–133. 3.King GF: Modulation of insect Ca(v) channels by peptidic spider toxins . Toxicon: Official Journal of the International Society on Toxinology 2007, 49 :513–530. 4.Clark JM, Symington SB: Pyrethroid action on calcium channels: neurotoxicological implications . Invertebrate Neuroscience: IN 2007, 7 :3–16. 5.Collet C: Excitation-contraction coupling in skeletal muscle fibers from adult domestic honeybee . Pflügers Archiv: European Journal of Physiology 2009, 458 :601–612. ●● In this article, the author showed that the action potential depolarization phase in honeybee muscle is carried by a voltage-dependent calcium current, which is blocked by allethrin, a pyrethroid insecticide. Calcium entry through voltage-gated calcium channel triggers the release of calcium from sarcoplasmic reticulum, leading to the transient increase of intracellular calcium concentration, and thus, muscle contraction. 6.Pringos E, Vignes M, Martinez J, Rolland V: Peptide Neurotoxins that Affect Voltage-Gated Calcium Channels: A Close-Up on ω-Agatoxins. Toxins 2011, 3 :17–42. 7.Catterall WA: Structure and regulation of voltage-gated Ca 2+ channels. Annual review of cell and developmental biology 2000, 16 :521–55. 8.The Honeybee Genome Sequencing Consortium: Insights into social insects from the genome of the honeybee Apis mellifera . Nature 2006, 443 :931–949. ●● The sequencing of the Apis mellifera genome allowed the identification of sequences encoding the VGCC subunits, and is the starting point of the development of molecular tools necessary to investigate the roles and the toxicity involvement of honeybee VGCCs. 9.Jeziorski MC, Greenberg RM, Anderson PA: The molecular biology of invertebrate voltage-gated Ca(2+) channels . The Journal of Experimental Biology 2000, 203 :841–856. 10.Ertel EA, Campbell KP, Harpold MM, Hofmann F, Mori Y, Perez-Reyes E, Schwartz A, Snutch TP, Tanabe T, Birnbaumer L, et al. : Nomenclature of Voltage-Gated calcium Channels . Neuron 2000, 25 :533–535. 11.Davies A, Kadurin I, Alvarez-Laviada A, Douglas L, Nieto-Rostro M, Bauer CS, Pratt WS, Dolphin AC: The alpha2delta subunits of voltage-gated calcium channels form GPI-anchored proteins, a posttranslational modification essential for function. Proceedings of the National Academy of Sciences of the United States of America 2010, 107 :1654–9. 12.Jeziorski MC, Greenberg RM: Voltage-gated calcium channel subunits from platyhelminths: potential role in praziquantel action . International Journal for Parasitology 2006, 36 :625–632. 13.Littleton JT, Ganetzky B: Ion Channels and Synaptic Organization : Analysis of the Drosophila Genome . Neuron 2000, 26 :35–43. 14.Jones SW: Calcium channels: unanswered questions. Journal of Bioenergetics and Biomembranes 2003, 35 :461–475. 15.King GF, Escoubas P, Nicholson GM: Peptide toxins that selectively target insect Na(V) and Ca(V) channels . Channels 2008, 2 :100–116. 16.Galizia CG, Rössler W: Parallel olfactory systems in insects: anatomy and function. Annual review of entomology 2010, 55 :399–420. 17.Grünewald B, Wersing A, Wüstenberg DG: Learning channels. Cellular physiology of odor processing neurons within the honeybee brain. Acta biologica Hungarica 2004, 55 :53–63. 18.Schäfer S, Rosenboom H, Menzel R: Ionic currents of Kenyon cells from the mushroom body of the honeybee . The Journal of Neuroscience: The Official Journal of the Society for Neuroscience 1994, 14 :4600–4612. ●● This study identified several outward and inward currents in isolated Kenyon cells from the honeybee mushroom bodies that are nervous centres involved in learning and memory. Among inward currents, a calcium current completely blocked at 50 μM cadmium and affected by verapamil and nifedipine only at high concentrations (100μM) was recorded. 19.Laurent S, Masson C, Jakob I: Whole-cell recording from honeybee olfactory receptor neurons: ionic currents, membrane excitability and odourant response in developing workerbee and drone . The European Journal of Neuroscience 2002, 15 :1139–1152. ● The authors characterized ionic membrane currents in honeybee olfactory receptor neurons (ORNs) isolated at an early stage of development. They distinguished four ionic currents and notably, detected in some ORNs a cadmium-sensitive calcium current. 20.Grünewald B: Differential expression of voltage-sensitive K + and Ca 2+ currents in neurons of the honeybee olfactory pathway . The Journal of Experimental Biology 2003, 206 :117–129. ● The authors investigated the voltage-sensitive and ligand-gated ionic currents in two neuron types of the honeybee olfactory sensory pathway: the mushroom body Kenyon cells and the antennal lobe projection neurons. In both neuron types, they found similar voltage-sensitive calcium currents which activate rapidly and inactivate slowly. 21.Perisse E, Raymond-Delpech V, Néant I, Matsumoto Y, Leclerc C, Moreau M, Sandoz J-C: Early calcium increase triggers the formation of olfactory long-term memory in honeybees . BMC Biology 2009, 7 :30. ● By using the Pavlovian appetitive conditioning of the proboscis extension reflex in the honeybee Apis mellifera and by modulating the intracellular concentration in the brain, the authors showed that during olfactory conditioning Ca2+ is both a necessary and a sufficient signal for the formation of long-term memory that depends on de novo protein synthesis. 22.Kloppenburg P: Anatomy of the antennal motoneurons in the brain of the honeybee (Apis mellifera). The Journal of comparative neurology 1995, 363 :333–43. 23.Kloppenburg P, Kirchhof BS, Mercer AR: Voltage-activated currents from adult honeybee (Apis mellifera) antennal motor neurons recorded in vitro and in situ . Journal of Neurophysiology 1999, 81 :39–48. ● The authors characterized voltage-activated currents from adult honeybee antennal motor neurons, both in vitro and in situ . They recorded a cadmium-sensitive calcium current that activated above -45 to -40 mV, with a maximum around -15 mV. 24.Ai H, Nishino H, Itoh T: Topographic Organization of Sensory Afferents of Johnston ' s Organ in the Honeybee Brain . Comparative and General Pharmacology 2007, 1046 :1030–1046. 25.Collet C, Belzunces, L: Excitable properties of adult skeletal muscle fibres from the honeybee Apis mellifera . Journal of Experimental Biology 2007, 210 :454–464. ●● The authors showed that action potentials in muscle fibres isolated from adult honeybee leg are not graded but all-or-none responses. These action potentials are shaped by both Ca2+ and K+ currents. The Ca2+ current is activated close to -40 mV and the mean apparent reversal potential is near +40 mV. The absence of sodium current has to be noted. 26.Soderlund DM: Molecular mechanisms of pyrethroid insecticide neurotoxicity: recent advances. Archives of toxicology 2012, 86 :165–81. 27.Ray DE, Fry JR: A reassessment of the neurotoxicity of pyrethroid insecticides. Pharmacology & therapeutics 2006, 111 :174–93. 28.Soderlund DM, Clark JM, Sheets LP, Mullin LS, Piccirillo VJ, Sargent D, Stevens JT, Weiner ML: Mechanisms of pyrethroid neurotoxicity: implications for cumulative risk assessment. Toxicology 2002, 171 :3–59. 29.Breckenridge CB, Holden L, Sturgess N, Weiner M, Sheets L, Sargent D, Soderlund DM, Choi J-S, Symington S, Clark JM, et al. : Evidence for a separate mechanism of toxicity for the Type I and the Type II pyrethroid insecticides. 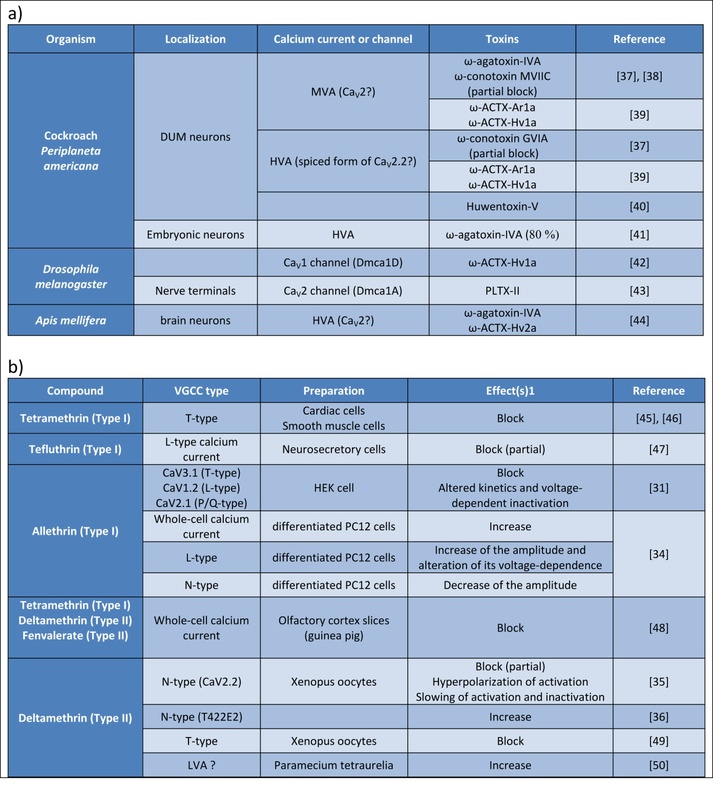 Neurotoxicology 2009, 30 Suppl 1 :S17–31. 30.Shafer TJ, Meyer D a: Effects of pyrethroids on voltage-sensitive calcium channels: a critical evaluation of strengths, weaknesses, data needs, and relationship to assessment of cumulative neurotoxicity. Toxicology and applied pharmacology 2004, 196 :303–18. 31.Hildebrand ME, Mcrory JE, Snutch TP, Stea A: Mammalian Voltage-Gated Calcium Channels Are Potently Blocked by the Pyrethroid Insecticide Allethrin . Pharmacology 2004, 308 :805–813. ● This study examines the effects of the Type I pyrethroid allethrin on the three major classes of mammalian calcium channels exogenously expressed in HEK 293 cells. Allethrin, at concentrations very similar to those reported for interaction with sodium channel, appeared to target all classes of mammalian calcium channels, causing a significant acceleration of the inactivation kinetics and a hyperpolarized shift in the voltage dependence of inactivation. 32.Symington SB, Frisbie R, Clark JM: Characterization of 11 commercial pyrethroids on the functional attributes of rat brain synaptosomes . Pesticide Biochemistry and Physiology 2008, 92 :61–69. ● The authors investigated the action of 11 commercial pyrethroids on Ca2+ influx and glutamate release by conducting assays with rat brain synaptosomes. They concluded that pyrethroids having an α-cyano group (Type II) seem to be more potent enhancers on Ca2+ influx and glutamate release under depolarizing conditions than Type I pyrethroids. 33.Cao Z, Shafer TJ, Murray TF: Mechanisms of Pyrethroid Insecticide-Induced Stimulation of Calcium Influx in Neocortical Neurons . The Journal of Pharmacology and Experimental Therapeutics 2011, 336 :197–205. ● The authors compared the ability of 11 structurally diverse pyrethroids to evoke Ca2+ in primary cultures of mouse neocortical neurons. Observing that TTX blocks the increase in intracellular calcium concentration caused by the 9 active pyrethroids, they concluded that pyrethroids stimulate Ca2+ entry into neurons subsequent to their activation on voltage-gated sodium channels. 34.Neal AP, Yuan Y, Atchison WD: Allethrin differentially modulates voltage-gated calcium channel subtypes in rat PC12 cells. Toxicological sciences 2010, 116 :604–13. ● In this study, it was tested whether allethrin alters VGCC characteristics measured by whole-cell recording in nerve growth factor-differentiated PC12 cells. Allethrin stimulated GVIA-insensitive current and inhibited nimodipine-insensitive current, affecting differentially VGCC subtypes. 35.Symington SB, Frisbie R, Lu KD, Clark JM: Action of cismethrin and deltamethrin on functional attributes of isolated presynaptic nerve terminals from rat brain. Pesticide Biochemistery and Physiology 2007, 87 :172-181. ● By measuring calcium influx and endogenous glutamate release in isolated rat presynaptic nerve terminals and by using rat brain CaV2.2 exogenously expressed in Xenopus ovocytes, the authors supported the conclusion that the N-type VGCC opening is altered by deltamethrin. 36.Alves A-M, Symington SB, Lee SH, Clark JM: PKC-dependent phosphorylations modify the action of deltamethrin on rat brain N-type (CaV2.2) voltage-sensitive calcium channel . Pesticide Biochemistry and Physiology 2010, 97 :101–108. ● This study revealed that one mutation mimicking the phosphorylation of the rat CaV2.2 channel altered the effect of deltamethrin: this insecticide reduced the peak current of wild-type channel and enhanced the peak current of the mutated channel. 37.Wicher D, Penzlin H: Ca 2+ Currents in Central Insect Neurons: Electrophysiological and Pharmacological Properties . Journal of Neurophysiology 1997, 77 :186-199. 38.Grolleau F, Lapied B: Dorsal unpaired median neurons in the insect central nervous system: toward a better understanding of the ionic mechanisms underlying spontaneous electrical activity . Journal of Experimental Biology 2000, 1648 :1633-1648. 39.Chong Y, Hayes JL, Sollod B, Wen S, Wilson DT, Hains PG, Hodgson WC, Broady KW, King GF, Nicholson GM: The omega-atracotoxins: selective blockers of insect M-LVA and HVA calcium channels. Biochemical pharmacology 2007, 74 :623-38. ● This study showed for the first time that ω-ACTX-Ar1a and its homolog ω-ACTX-Hv1a, two ω-atratoxins from two Australian funnel-web spider venoms, reversibly block both M-LVA and HVA insect calcium channel currents. 40.Deng M, Luo X, Meng E, Xiao Y, Liang S: Inhibition of insect calcium channels by huwentoxin-V, a neurotoxin from Chinese tarantula Ornithoctonus huwena venom. European journal of pharmacology 2008, 582 :12-6. ● The authors demonstrated by using whole-cell patch clamp experiments that huwentoxin-V specifically inhibited HVA calcium channels in adult cockroach dorsal unpaired median neurons. They proposed moreover a classification of insect neuronal HVA calcium into four types depending on their sensitivity to different toxins. 41.Benquet P, Fusca D, Le Guen J, Dayanithi G, Pichon Y, Tiaho F: ω -AgaIVA − Sensitive ( P / Q-type ) and Resistant ( R-type ) High-Voltage − Activated Ba2+ Currents in Embryonic Cockroach Brain Neurons. Journal of Neurophysiology 1999, 82 :2284-2293. 42.Tedford HW, Maggio F, Reenan R a, King G: A model genetic system for testing the in vivo function of peptide toxins. Peptides 2007, 28 :51-6. 43.Kuromi H, Honda A, Kidokoro Y: Ca 2 Influx through Distinct Routes Controls Exocytosis and Endocytosis at Drosophila Presynaptic Terminals . Neuron 2004, 41 :101-111. 44.Wang XH, Connor M, Wilson D, Wilson HI, Nicholson GM, Smith R, Shaw D, Mackay JP, Alewood PF, Christie MJ, et al. : Discovery and structure of a potent and highly specific blocker of insect calcium channels. The Journal of biological chemistry 2001, 276 :40306-12. ● By screening the venom of the lethal Australian funnel-web spider Hadronyche versuta , the authors isolated a novel family of insect selective neurotoxins that appeared to be potent blockers of insect voltage-gated calcium channel, displaying at least a 10 000-fold preference for insect versus vertebrate calcium channels. 45.Hagiwara N, Irisawa H, Kameyama M: Contribution of two types of calcium currents to the pacemaker potentials of rabbit sino-atrial node cells. Journal of Physiology 1988, 395 :233-253. 46.Yabu H, Yoshino M, Someya T, Totsuka M: Two types of calcium channels in smooth muscle cells isolated from guinea-pig taenia coli. Adv Exp Med Biol. 1989, 255 :129-34. 47.Wu S-N, Wu Y-H, Chen B-S, Lo Y-C, Liu Y-C: Underlying mechanism of actions of tefluthrin, a pyrethroid insecticide, on voltage-gated ion currents and on action currents in pituitary tumor (GH3) cells and GnRH-secreting (GT1-7) neurons. Toxicology 2009, 258 :70-77. 48.Narahashi Toshio: Sites of Action for Neurotoxic Pesticides . In Sites of Action for Neurotoxic Pesticideseurotoxic Pesticides . Edited by Hollingworth RM, Green MB. American Chemical Society; 1987:226-250. 49.Catlin N, Symington SB: Deltamethrin Inhibits the Human T-type Voltage-Sensitive Calcium Channel ( Ca v 3 . 2 ) . In Impulses : The Premier journal for Undergraduate Publications in the Neurosciences . 2008:1-9. 50.Symington SB, Zhang A, Karstens W, Houten JV, Clark JM: Characterization of Pyrethroid Action on Ciliary Calcium Channels in Paramecium tetraurelia . Pesticide Biochemistry and Physiology 1999, 193 :181-193.